In “Roma”, Mexican director Alfonso Cuarón draws on his own childhood memories to create his masterpiece — a visually splendid tribute in black-and-white to the maid who helped raise him. 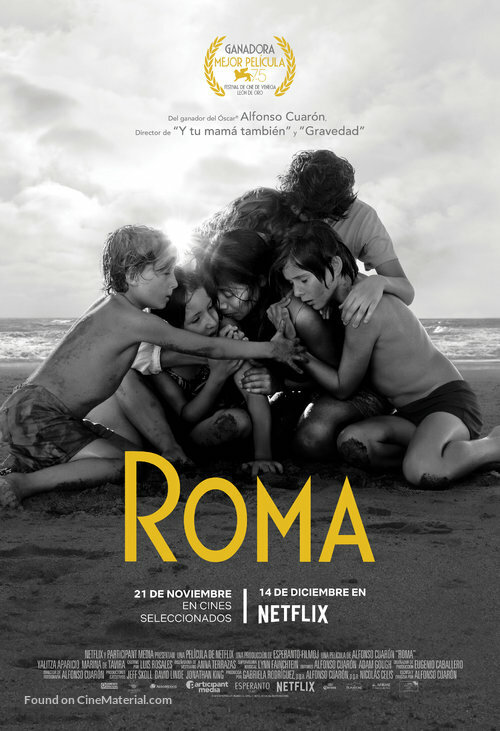 The film is set in Roma, a suburb of Mexico City, in 1970-1971 and centers around Cleo (first-time actress Yalitza Aparicio), an indigenous maid who works for a middle-class family. At the beginning, we follow Cleo with her everyday tasks — cleaning the driveway, doing the laundry, cleaning the home and taking care of the children like they are her own. She lives in an upstairs small room at the end of the driveway with her friend and fellow servant Adela (Nancy García). It soon becomes clear that the family can’t live without Cleo. The mother, Sofía (Marina De Tavira) is present but has to deal with the abandonment of her husband (Fernando Grediaga) and father of her four children (one girl and three boys). The children, in the dark about their father’s desertion, live with their innocence and imaginative minds playing in a sweet cacophony around the house. A few other events come to disturb the apparent peace — an unexpected pregnancy followed by another abandonment, civil unrest with a student demonstration, an earthquake and death. The film observes the life of this family and the people within it without judgement. Cleo isn’t just the maid; she is an integral part of the family. The story is small in scale but leaves a mark on anyone who sees it — at least it did on me. It is a beautiful, emotional and intimate film that celebrates the complexity of life and honors the small moments.